Mr. Darcy and the Secret of Becoming a Gentleman Blog Tour with Author Maria Hamilton, & a Giveaway! 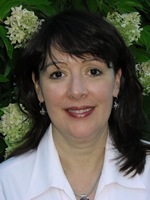 Please join us today in welcoming Austenesque author Maria Hamilton for the official launch of her book blog tour of Mr. Darcy and the Secret of Becoming a Gentleman, a new Pride and Prejudice variation that was released on May 1, 2011 by Sourcebooks. With my first novel, Mr. Darcy and the Secret of Becoming a Gentleman being published just days after the royal wedding, I can’t help but relate the two events. It may be because I unconsciously measure all men, including the occasional real life prince, to Mr. Darcy and usually find them wanting. Like most women who love Mr. Darcy, it isn’t because he is good looking or rich (although it doesn’t hurt) but rather because his choice of a bride is emblematic of the depth of his character and good heart. What makes Mr. Darcy still appealing to modern women is that he falls in love with Elizabeth Bennet because of her wit, independence, and intelligence. Moreover, he values Elizabeth’s opinion of him enough to inspire him to improve his character and win her regard. Jane Austen wisely makes Mr. Darcy wealthy, powerful, and attractive thereby making his devotion to Elizabeth in spite of his family’s censure all the more poignant given the endless array of women actively pursuing him. While 200 hundred years have passed since Pride & Prejudice was written, it is just as difficult now as it was then to find a good man and particularly one who understands what is required to please a woman worthy of being pleased. There is an obvious parallel to the royal weddings with their implicit speculation of why a particular prince selected his bride. 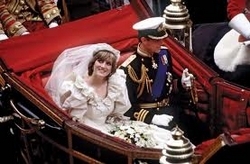 We will never truly know why Prince Charles, age 31, asked Lady Diana, age 19, to marry him, but the fact that she had an appropriate pedigree by title and religion and an unsullied past had to weigh heavily. I am old enough to have watched their wedding optimistically assuming that he also held her personality traits in high regard and that overtime their relatively short courtship would ripen into a marriage of true minds. As we know, it didn’t. It may have been that Prince Charles, to his own detriment, could not listen to the needs of his heart over the call of duty or that he couldn’t value Princess Diana’s independence as she matured into a mature women. Mr. Darcy, in a similar situation, innately understood that what a man in his position needed most was a partner that could challenge him and could, over time, inspire him through the strength of her personality to be a better man. The recent wedding between Kate Middleton and Prince William seems more likely to aspire to Mr. Darcy’s ideal. While an age difference is no impediment to a vibrant love match, their mutual maturity bodes well for handling the media interest that will inevitably seek to overwhelm them. They have been together long enough to understand each other personalities and value each other’s difference. Prince William has already proven willing to break with family tradition and select a woman he values over concerns regarding station or outdated notions of propriety. Let us hope that he can continue to emulate the best characteristic of Mr. Darcy. It is the perpetual hope of that fulfillment of love that inspired me to write my novel, Mr. Darcy and the Secret of Becoming a Gentleman. I have long adored Pride & Prejudice. Darcy’s character is amazingly nuanced given that we only see his personality through his actions and hear very little of his inner life. Jane Austen famously never wrote a scene between men where a woman was not present. Consequently, there are “scenes” in Pride & Prejudice that seem missing. The propriety of the age also required that there be a minimum of private dialog between our hero and heroine. As a result, much of their courtship is left tantalizingly to reader’s imagination. With each reread, my cravings for these missing scenes eventually lead me to envision a different course for the story where those scenes could be played out more fully. I introduce us to Mr. Darcy after Hunsford when he is attempting to overcome Elizabeth’s rejection and struggling with the knowledge that he has unfairly separated Mr. Bingley from Jane. He determines to correct his mistake much earlier and in the process of doing so returns to Hertfordshire. As Elizabeth and Mr. Darcy become reacquainted, he pursues her and a slow courtship evolves as they attempt to see each other without their prior misunderstandings. My story focuses on the dialog between Mr. Darcy and Elizabeth and tries to explore their developing intimacy. I believe the story holds true to the original but allows the modern reader to go where Jane Austen could not. I hope you agree. Maria Hamilton has been a lifelong Jane Austen fan. Her first novel Mr. Darcy and the Secret of Becoming a Gentleman will be published by Sourcebooks in May of 2011. She is presently working on several projects including a new Pride & Prejudice variation. She attended Boston College where she earned a B.A. and then a M.A. in history. She received her J.D. from Harvard Law School and presently works as an attorney in Boston. Her interests include travel, politics, cinema, the Red Sox, and bicycling. She is perpetually learning Italian and hopes one day to attempt a complete conversation. She lives in southern New Hampshire with her husband, two children, and her dog Poseidon. Visit Maria at her website: Austen Interludes, and blog: Austen Authors. 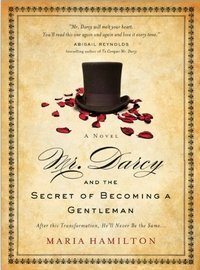 Enter a chance to win one of three copies of Mr. Darcy and the Secret of Becoming a Gentleman, by leaving a comment answering what intrigues you most about reading a Pride and Prejudice variation, or which of Austen’s novels or characters you would like to see Maria write about next, by midnight PT, Wednesday, May 11, 2011. Winner announced on Thursday, May 12, 2010. Shipment to US and Canadian addresses only. Good luck! « The Truth About Mr. Darcy Blog Tour with Author Susan Adriani & a Giveaway! I am intrigued by the different viewpoints. I love reading the story from Darcy’s point of view, because you can see what a transmorfation he underwent before meeting Elizabeth in Pemberley. There is a period of time in Pride and Prejudice where you have no idea what he is doing, and I love to imagine what might have happened to him in that time. I think it would be interesting to read a Jane Austen novel from the perspective of a minor character who cares deeply about those involved, yet doesn’t have much of a story of their own. Kitty, for example. She may be shallow and silly, but I have always believed that there is hope for her. I think it would be fun to read a story about her watching Jane, Elizabeth and Lydia with their romances. Perhaps after seeing how they turned out, she might grow up a little. This book looks lovely and I am really looking forward to reading it. Thank you! How did I miss this? I’ve been reading as many P&P related books I could find, and this one didn’t end up on my to read list? It sounds so good!!!! I’m anxious to read the ‘missing scenes’ the author referred to, to get a stronger picture of Darcy’s realization of Elizabeth’s qualities. And the inclusion of more and longer dialogs sounds intriging. Thanks for the giveaway. I read Austen variations – particuarly P&P variations – because I enjoy revisiting the characters I first fell in love with 30+ years ago. Darcy is my definitive male hero, and I tend to envision just about every male character in any book as being him anyway, so I might as well read a book in which he really is set. And who doesn’t love Elizabeth Bennett? A beautiful, intelligent woman who impresses a man of 10,000 pounds a year with her lively wit? What a great couple! I’ve always been curious about the missing scenes in P&P involving Mr. Darcy. I would for Maria Hamilton to “fill in” the missing scenes when Captain Wentworth ‘planned’ his every move to gain Ann back. I love variations because they show different ideas about what could happen to the main characters. It sounds cheesy, but as a reader, I get so sad when the book ends, and I wonder what the characters would be doing afterwards (what adventures or tragedies they would have). Just wanted to mention that only last night I discovered that my favorite Mr. Darcy, Colin Firth, also appears in a little-known fairly recent film called Main Street. I had not heard of it before. Lizzy and Darcy are my favorite literary characters and it’s always a treat to revisit and see them in different scenarios. I think Mr. Darcy is still such a mystery to people and we just want to get a deeper understanding of his motives. I know I do! This book should be interesting because it will give us insight into the conversation between Elizabeth and Mr. Darcy when they decided to get married. I really wanted more dialog in Jane Austen’s “Pride and Prejudice” especially since her work is always about dialog. Maybe Ms. Hamilton’s book will fill in the blanks. Can’t wait to read it! I am really looking forward to reading Maria Hamilton’s new book and revisiting my favorite literary characters. It has always been such a mystery as to what Mr. Darcy’s feelings and motives have been and now we can feel what he really wanted to say and couldn’t. Romance – there’s nothing like it! This book sounds interesting since in Pride & Prejudice, we don’t really see Mr. Darcy’s transformation on the page. We know that it happened after the first proposal and when we next see him in Pemberley, but it would be intriguing to read about exactly how it took place. I just want to say thank you, Maria, for feeding my Pride and Prejudice addiction; and I hope you have much success! I’d love a new sequel or variation of Persuasion or Mansfield Park. They are my favorite JA books. P&P is third. I enjoy reading Jane Austen variations of any type including mysteries and further looks into the personalities of characters I love.Jane Austen variations appeal because I love her time, the courtship, the mannerisms, the earnest love. I look forward to reading this novel. Thank you for the giveaway. As I’m in the middle of edits on my own Darcy story, my interest in yours is obvious. I too adore Mr. Darcy, and I love seeing how other authors envision him. The lovely (and slightly scary) thing about Austenesque novels is that we all see the characters through the lens of our own experience. My favorite part of reading adaptations is the way they broaden my own views. I look forward to learning more about Mr. Darcy as I read your novel. I nodded my head to so many of the comments above. I know Austen “purists” who won’t deign to read anything other than what Jane Austen actually wrote. I honor Jane by continuing to read the “sequels” in tribute to Jane’s character development. I can’t get enough of her characters, most especially Darcy and Elizabeth. Once school is out I plan to count and organize my JA fanfiction, as well as my nonfiction related to JA. I’ll keep buying these books in hard copy (paperback, actually) as long as they keep coming with good recommendations! Thanks for the opportunity to win a copy of the book. If I don’t win I’ve already got this book in my amazon queue. I love to read anything about Jane Austen including all the variations!!! There is a P&P variation called The Prince and the student, drawing inspiration from Prince William’s romance. It’s good to read about Maria’s book, very interesting. Since there isn’t an endless supply of Austen novels, I love how other authors have taken her stories and made them their own. I would really love to read this one (and think the book cover is beautiful)! Thanks for the chance!! I love reading P&P variations because I can never get enough of Mr Darcy! This story sounds wonderful!! I love variations because it’s fun to read someone else’s idea of the ending. I think it would also be cool if she wrote a version of Emma (with slight variations and added conversations)! I first read Ms.Hamilton’s story when posted on line years ago under the title, “By Every Civility in His Power”… and was delighted to learn it was to be published by Sourcebooks. Brava! Thank you for the wonderful interview!! I really enjoyed it :) I am also a huge fan of anything Jane Austen, and I am “completely and incandescently happy” when I sink into my comfy spot & get lost in my reading. I love the variations because there are just so many directions you can go with the characters. My favorite, for forever, has been the story of Darcy & Elizabeth. But I would love to see more variations of Anne Elliot and Captain Wentworth from Persuasion. The other story variations that I would love would be those of Elinor & Marianne Dashwood from Sense & Sensibility, and Catherine Morland from Northanger Abbey. The thing I love reading variations is seeing the road not taken. It’s great to see another persons take on the story and characters and see what spin they put on it. They make the characters their own and it’s like a new story. Even though I’ve read multiple variations, each one is different and unique and that’s what I love. Also, I think I would really like for Maria to handle a variation on “Mansfield Park” since she seems quite comfortable (and very good at) writing about royalty and the upper-class and such. I would love to see her perspective on Mansfield Park. What I like about a P&P variation is that there is so much unwritten. What was Darcy thinking? What did they courtship look like? What happened after the wedding? I especially love a road not taken. I am excited to read the book! What I like about a P&P variation is we see different perspectives and visit the characters we love so dearly again. Thanks for this giveaway. I agree with the last comment: I think it all comes down to what Jane Austen left us, a little treasure which we can’t get enough of, especially P&P. Her stories make me want to go further, and the possibilities are endless; and the sequels and variations, while they give new perspectives on JA’s characters, they also make me want to go back to her writings and explore them all over again. I can’t wait to read Mr. Darcy and the Secret of Becoming a Gentleman ! I would love to see more Fanny and Edmund. Either a story behind the story (what they were really thinking), alternating viewpoints or a continuation. I think both F and E get a bad rap or maybe just not enough credit, so hearing the backstory would be fun. The various Jane variations continue to offer new insights into each of her characters! What intrigues me most about P&P variations is the course the book takes. I know that Darcy and Elizabeth will end up HEA, however I get so excited and wrapped up in the question, “how will they get there?” I love to see how each author takes a different spin on getting the two to the ending. I love Austen variations that give me that comfortable feeling of catching up with old friends. That is how well written Austen’s characters are and why we are compelled to see where an author will take them when we next visit them. I have to admit I had a light bulb moment that really startled me, when I recently read Meredith’s review for this book at Austenesque Reviews. I didn’t realize that I felt the same way towards my husband as Elizabeth did towards Darcy. He says he knew he loved me early on (which explains why he put up with so much) but I really, really did not like him at first, due to a misconception. I was forced to be pleasant to him since we had to work together, which later grew into friendship, respect and love. We have known each other for over 20 years and will have our 16th anniversary at the end of May, I don’t think I need any other reason to like P&P variations. Sounds like a wonderful book. Would be interesting to see her take on characters from Sense and Sensibility or Emma, which are also favorites of mine.